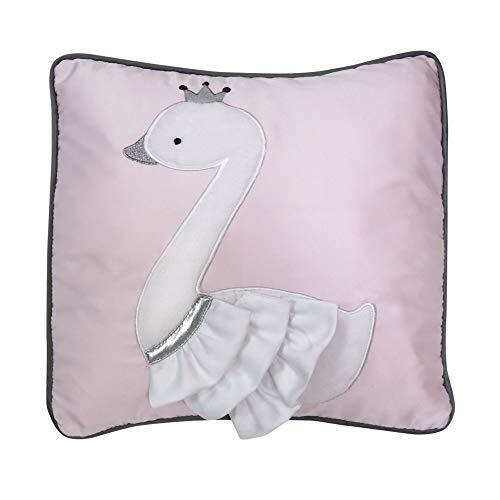 This lovely keepsake pillow features our elegant ruffled swan with silver trim on a soft pink sateen ground. Princess, our favorite swan, has three satin ruffles and always wears her silver crown. A gray sateen piping adds an extra touch of elegance. The back is a pretty floral print on a light pink background. Cotton poly fabrication. The pillow case is removable for easy washing. Care Instructions: Remove inner case from cover. Machine wash cold with like colors. Gentle cycle. Do not bleach. Tumble dry low. Iron on lowest setting as needed. If you have any questions about this product by Lambs & Ivy, contact us by completing and submitting the form below. If you are looking for a specif part number, please include it with your message.